It’s not often that I’m surprised by anything, having the ability of seeing what is approaching long before it arrives, but today I was. A letter arrived from my good old friend, Giraffe who lives in California. I wasn’t surprised that he sent me a letter; I was surprised at what he had to tell me. 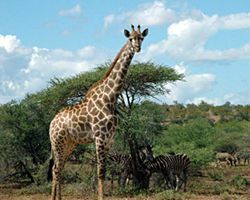 Giraffe wrote of the beautiful beaches, pleasant weather and delicious trees. He still insists that the California weather makes the apricot trees taste the best. While that may be so, I still prefer acacia trees no matter where they grow. But then Giraffe had something new and exciting to tell. He met two friendly humans, Abdul and Wajia, at a really cool store called Game Master who were happy to show him this exciting new game. Giraffe wrote of a game where all the pieces stay on the board and where all the animals get to play until the game is over. And he wrote it’s so easy to learn that it took only a minute. This sounded familiar. And it should, it was Barca – The Watering Hole Game my friends and I play all the time! Was I surprised! You can get Barca as a game! I thought you had to gather a group of mice, lions and elephants together in order to play. Believe me that’s not easy; the mice keep scaring the elephants and the lions are constantly being chased off by the running elephants. Barca the board game is much easier to play. It’s even a travel version so you can easily take it along and play with friends. The secret is out of the savanna, so everybody can enjoy Barca now! I’m going to stick my neck out and say you’ll become a fan of Barca like my good old friend Giraffe and I. 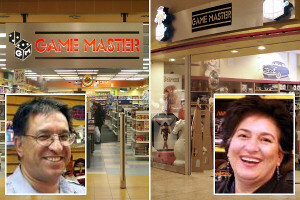 So if you’re in southern California, go check out Barca at the Game Master in The Shops at Mission Viejo and in the Laguna Hills Mall. Abdul and Wajia will be happy to assist. It was one of those perfect summer days on the savanna. The sun’s soft rays flickered through the tree while I grazed on the sweet leaves. A gentle breeze in air brought to my attention that other animals where near by. Pausing my snack, I raised my head even higher to look around. Upon viewing my surroundings, I came to see a watering hole in the distance with some activity. But the animals by the watering hole where behaving differently than I had ever seen before. Fascinated, I kept watching. They where running around the watering holes jumping in and out. At first only the lions and elephants could be seen, and after giving it more attention, I also saw mice. How strange, what were the mice, lions and elephants doing? My curiosity got the better of me and I headed down to find out. I strode up to one of the elephants, as I’ve always found them to be the most polite, and asked what was going on. She replied they where playing a game they made up. In one minute the elephant explained to me of this game where nobody stops playing until everyone stops playing. She told me that playing this is better because nobody has to sit out and watch the others play. It was so simple and yet engaging. As I asked the elephant the name of this new game, a mouse jumped into the air exclaiming “Barca!” as he cannonballed into the watering hole (it was really more of a golf ball than a cannonball). That was my introduction to Barca and I’ve been a fan ever since. And I think you’ll be a fan too when you get to know how to play. So with my natural abilities of looking around I’m going to report where to get Barca, where to play Barca and any Barca related events. I’m calling my report the Lowdown. Welcome to the Lowdown, where you’ll get the latest Barca news! Copyright © 2011-2017 Andrew Caldwell. All Rights Reserved.